Residential homeowners and commercial builders and remodelers looking for high quality and affordable bathroom granite countertops in Nashville, Tennessee, and the surrounding areas use MC Granite Countertops Nashville warehouse for their bathroom vanities countertop projects. 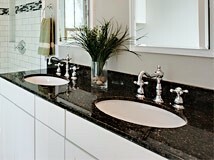 AT MC Granite Countertops Nashville more than 50% of our business comes from referrals and repeat customers. “This means customer satisfaction at its best! With over 15 years experience in residential and commercial bathroom granite countertops sales, template, fabrication, and installation, MC Granite Countertops Nashville Warehouse is family owned and operated proudly to serve Georgia and vicinity since 2000. At MC Granite Countertops Nashville, we are proud of our incredible record of highly satisfied customers with our fabrication and installation of bathroom countertops in Nashville and the surroundings areas. If you are thinking about bathroom remodeling in Nashville contact MC Granite Countertops Nashville for all of your granite countertop needs. You will be happy you did!. A tough decision you will have when planning your bathroom remodeling is deciding what granite color will be perfect for your Bathroom countertops but will also meet your budget. With MC Granite Countertops Nashville Warehouse you get a 100% Warranty in Labor and Materials.At MC Granite Countertops, we focus on helping you select the perfect granite color for your bathroom countertop project based on your color preference, not on the price. MC Granite Nashville will not attempt to sell you the most expensive granite available but instead we take pride in helping you choose the best color for your kitchen. Our large color selection allows us to offer you the right color at the right price. At MC Granite Countertops of Nashville, we backup what we promise with our 100% Lifetime Warranty on Fabrication, Installation and Material of your Bathroom Countertops. See what customers are saying about MC Granite Countertops in Google or Yahoo Reviews, and find out why we are rated a “FIVE STAR COMPANY” , or Go on to check us out at the BBB “Better Business Bureau.